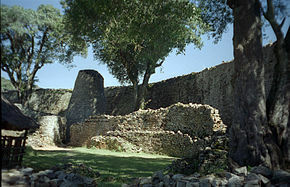 "Great Zimbabwe is a ruined city in the southeastern hills of Zimbabwe near Lake Mutirikwe and the town of Masvingo. It was the capital of the Kingdom of Zimbabwe during the country's Late Iron Age. Construction on the monument by ancestors of the Shona people began in the 11th century and continued until the 15th century, spanning an area of 722 hectares (1,780 acres) which, at its peak, could have housed up to 18,000 people. It is recognised as a World Heritage Site by UNESCO."